Throughout history, industrial revolutions hinge on the power of automating processes. While automation today offers many benefits, imagine if you could automate thousands — or even millions — of processes simultaneously across any layer of the enterprise IT network. This is the next potential wave of innovation, and it’s the organizations that are “geographically dispersed” or “automation heavy” that will benefit the most from fully connecting all end points — even those in the access layer. While long-range communications and connectivity have become increasingly easier to attain, businesses need to break down their isolated islands of automation to achieve comprehensive automation at scale. For example, there always has been a clear line dividing operations technology and information technology networks. The emergence of the internet of things blurs that line as industrial operations head in the direction of complete connectivity for all devices on a network — including those remotely located in the field. With dedicated solutions for the IT access layer, IoT data can be analyzed, acted upon and transmitted from anywhere in an industrial IoT network. Being heavily entrenched in the IIoT and M2M technology markets, I’m fortunate to have the opportunity to speak with customers, partners and analysts about what technology advances are on the horizon that will benefit the industry. A few of the hot buttons right now are big data and predictive analytics. The idea of comparing data in motion (at the sensor level) to data at rest (in a big data server warehouse) with predictive analytics in the cloud is very appealing to many customers. The problem the big data vendors have, however, is access to that data in motion at the sensor location. Perhaps legacy SCADA systems are inadequate as there are very few options for the local execution of predictive analytics applications to apply changes actively in the field. The access layer is the edge of the IT network. An IT infrastructure has a core that is home to all the big data and data analytics. At this core, the data is “at rest” because it has reached its final destination. Next is the distribution layer of the IT infrastructure which is where the major plants, sites and facilities are located. 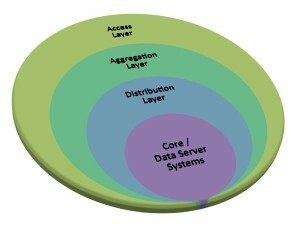 Further out is the aggregate layer where data at the next level in the network is collected. Extending out even further is the access layer. In oil and gas, for example, oil pads are part of the access layer because they are typically remotely located at the edge of the network. It is highly likely that sensors physically exist in this layer for monitoring and control of these devices. Additional examples of the access layer are tanks, refinery sites and ocean exploration vessels. In water/wastewater, the access layer of the network is the location of treatment facilities that have the water meters, pumps, smart meters, etc. Essentially, the access layer is the furthest point at which the operators are collecting sensor data. Industrial organizations today need intelligent secure communication and transmission from the sensor data back to the appropriate server, and there are a number of available options. What’s needed in the future is technology that provides a tiered application architecture where application platforms can be deployed at the access layers of an industrial network. It would need to have the ability to securely collect, aggregate, analyze and transmit real-time sensor data in motion to the predictive analytics cloud, then execute commands at a local level based upon the outcome of those analytics. To do this effectively, organizations would also require specific expertise in connecting and collecting data from a wide range of sensor technologies in multiple industrial settings and from distances both short and long — and do so under extreme environmental circumstances. This is the only way that big data companies can maximize production/profitability and minimize risk/cost for their industrial clients. The increasing shift toward IIoT tends to bring up a lot of questions about the continued value of SCADA systems that have traditionally served as the driver for monitoring and control in industrial markets. Although OT and IT are beginning to converge, there is still high demand for SCADA data. However, new technology offers the opportunity for data to be used in ways that were previously not possible, such as predictive analytics. This doesn’t make SCADA obsolete, as many operators are using it and will continue to employ it. Going forward, industries will leverage new technologies designed to help them make better business decisions than with just SCADA alone. Enabling sensor to server (S2S) strategies means deploying intelligent communication that begins at the sensor level and targets servers for specific reasons. These servers could include anything from a SCADA data server that collects and monitors through the SCADA system or a big data engine. S2S could be leveraged in a predictive analytics engine that compares data at rest stored in a database to data in motion in real time from the access layer of the network. The concept of S2S extends beyond transmitting data. It is about creating intelligent transmission from a specific location back to the appropriate server with the appropriate intelligence to drive action for change. As IoT becomes adopted by industrial markets, there is going to be an increased demand for video, voice, data and sensor data communication from the outermost layer of the network (think sensors on oil pads or water tanks). Industries like oil and gas, electric power, agriculture and utilities are starting to pick up on the benefits of S2S when it comes to profitability and cost savings through more advanced data analytics. I am not an expert and I have never performed this myself. But, as per my understanding I believe that we need put the phone under simulated load that will give us results under peak load. We can use simulators and performance testing tool to execute this task. We have to execute some real user’s scenarios under the load test. Also, we need to perform manual real world scenarios. There are different memory, processor, screen size, resolutions and different network so it becomes really important. Testing should be performed until we get the expected and satisfactory results. Mobile phones have become an essential part of our lives. With the increase in usage and capabilities of mobile application the devices become more complex in their functionality. So it is important to do the performance testing on mobile applications before deploying to actual platform. 1. To analyze server condition: It consists of load on server, workload type etc. 2. To analyze network conditions: It consists network load, Network type and quality etc. 3. To analyze device conditions: It contains device type, application type & platform type etc. 1. Load, CPU usage, Packets sent/received under server part. 2. Packet loss, average delay under n/w conditions. 3. Memory usage, response time under device condition. What a great post. The use of emulators, vms, or even simulated hardware in a lab to test some of these constraints makes a heck of a lot of sense to me.